Harlington is a Bedfordshire village between Luton and Bedfordshire. It has a population of around 2260. 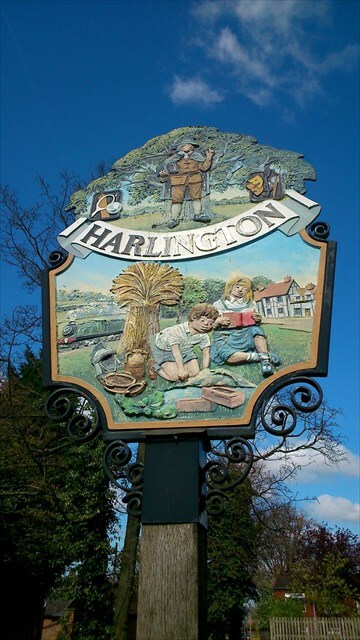 In the Domesday Book (1086), the village appears as Herlingdone. The sign includes an image of John Bunyan. In 1660, he was arrested for leading an unauthorised religious meeting at a farmhouse near Harlington. He was taken to Harlington House (now known as Harlington Manor - the only currently occupied residential house connected with Bunyan). After being questioned he was imprisoned for twelve years in Bedford county gaol. It also includes a steam train. 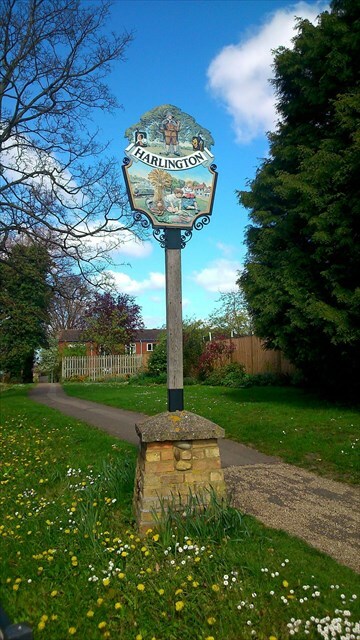 Harlington station opened in 1868. On the opposite corner to the village sign is the war memorial, to those men of the village who lost their lives in World War One. There is a plate at the fron which says "TO THE MEMORY OF THOSE WHO SERVED IN THE WAR 1939 - 1945" Above this are X names under the heading 1939 - 1946. Simply use this to calculate the final coordinates to find the cache! The cache is one of my 'glue stick' caches. Congratulations to The Bongtwashes on being First To Find.